We have heard of a restaurant outside of town called Casa de Piedra at Hacienda Xcanatun and drive out to find it. It is in a small village on the outskirts of Merida, and when we turn off the main road we are convinced we must be in the wrong place. It is a working class Mexican village with a dirt football pitch serving as the town square. There are a few youths trying to skateboard on a patch of concrete, a couple of Datsuns from the early 80’s and a beat up Mustang parked around the square. The houses are all one and two room low square buildings with nothing to recommend them to anyone. We drive round the village square but there is no sign for, or of, the restaurant. We are convinced we are in the wrong place, but then we see a 12 ft wall painted a rather wonderful deep red color down one of the streets. When we reach it there is a beautiful ironwork gate opening on to a driveway that leads to the hotel and restaurant. The hotel is quite fabulous, all painted in the same deep red color, with huge rooms and very high ceilings. The grounds are full of beautiful old trees and palm trees, subtly lit. 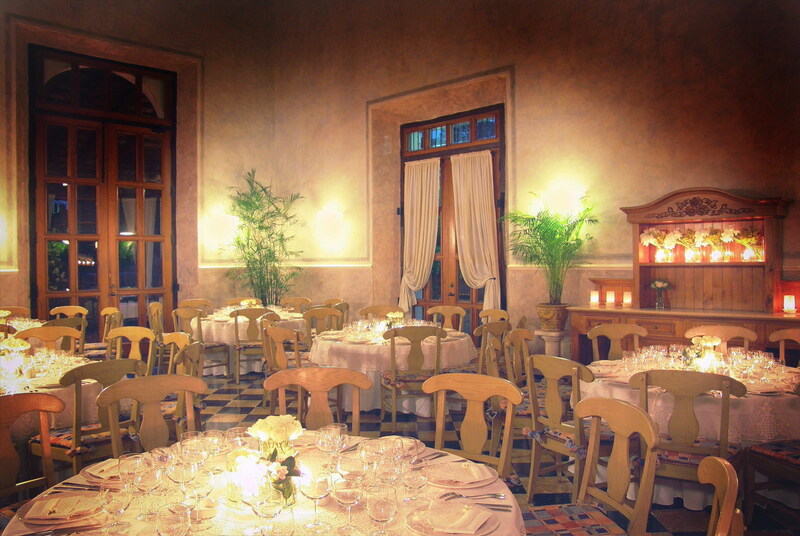 Hacienda Xcanatun was built in the 18th century, for the owners of a factory producing sisal. The hacienda is now an upscale hotel, while Casa de Piedra, the restaurant, is located in the old factory building next door. It has been renovated beautifully. The ceilings are 30 ft tall, and the old machinery and pulleys are still there, but restored and painted black. The walls are faux painted in subtle shades of blue and grey, and the tables are beautifully presented with flowers and starched tablecloths. I do not usually write a restaurant review as part of my travel muse, but in this case I can’t help it. It is the best food we have ever eaten in Mexico. I start with a duck and pine nut pate. The portion is huge, and it is served with a wonderful mustard sauce. It is terrific and brings back memories of French picnics. Next I have a fish steak, the fish is called Bruja and it is the most perfectly cooked piece of fish you could imagine. It is served on a bed of leek puree, and is delicious. Gordon has duck in a chocolate and mango mole, a fantastic combination that we have never come across before. The restaurant is busy the entire evening. We get there at 8pm, and there is a large group of elderly tourists, dressed to the nines and dripping in jewels who are obviously there on some sort of very expensive coach tour. But, more interestingly, Mexicans arrive to eat throughout the evening. These were not the locals we had seen in the village, but immaculately tailored men oozing power, with their expensively dressed and overly made up spouses. They ordered without looking at the menu, demanded a great deal of attention, and were incredibly rude to the waiters. This entry was posted in Casa de Piedra, Hacienda Xcanatun, Merida. Bookmark the permalink.